This summer was filled with a seemingly endless stream of tragic shootings. Sometimes it feels like there's nothing we can do to stop the carnage -- but we have to remember that we're fighting for long-term change, and that change starts with YOU. One of the best ways to advocate for stronger gun laws is to show it, and make sure your friends and neighbors see it too. Are you with us? If so, use the form on this page to claim your free sticker now -- and we'll put in the mail to you right away. Use the form below to tell us where to mail your sticker. Mo S. just signed the Get Your Free "Change Congress" Sticker petition. Hailey S. just signed the Get Your Free "Change Congress" Sticker petition. 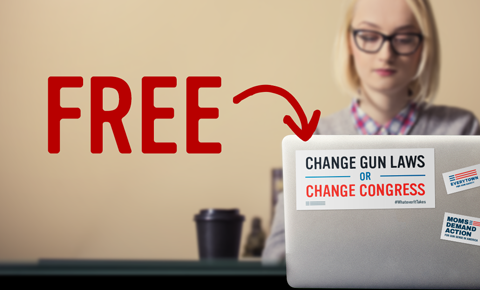 Abby K. just signed the Get Your Free "Change Congress" Sticker petition. Tyrone D. just signed the Get Your Free "Change Congress" Sticker petition. Deena M. just signed the Get Your Free "Change Congress" Sticker petition.